It's a new beginning. The first day of 2013 - and everyone is all new and shiny. Except we aren't. Today is yesterday's tomorrow, as it was yesterday and the day before that. While it is really easy to say that I'm going to be a better person this year, it's unrealistic. The same things that stopped you from "doing right" yesterday are there today. The above issues don't magically go away because it's 2013. Your taste buds don't know it's 2013. And trying to make a dramatic change that doesn't really fit your life or who you are is a set up for failure. I hate failure, so I choose not to "resolve" anything just because it's 2013. Yes, there are some things I would like to accomplish. I'd like to pay off debt, I'd like to be more in shape, I'd like to write more. But not because it's 2013, because those things are necessary for me to move forward in life. *Ed note - Not all of the above bullets are autobiographical, but purple drank is delicious. I should never have bought it. It's even worse because I sing "purple drank" every time I open a can. 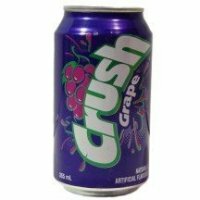 Also, because I am a lame, when I say purple drank, I really just mean grape pop.